The Los Angeles County Sheriff’s Department recently destroyed 3,566 confiscated weapons that will be converted into steel rebar for use in highway and bridge construction projects in California, Nevada and Arizona. Division Chief Eric Parra oversaw the destruction of the weapons, which included 1,359 handguns and 684 rifles and shotguns confiscated by the sheriff’s department. Additionally, 987 handguns and 536 rifles and shotguns confiscated by other law enforcement agencies in the county including the Beverly Hills and Los Angeles police departments were destroyed. The weapon destruction occurs every July in compliance with the California Penal Code, which calls for weapons unable to be sold to the public or returned to their owners to be destroyed. Thousands of pounds of metal were processed at 3,000 degrees Fahrenheit and remolded into materials for upgrading roads, highways and bridges. The weapons included guns confiscated in criminal investigations and probation seizures, as well as firearms surrendered by citizens. For the past 25 years, Gerdau Steel Mill has donated its furnace, equipment and personnel to convert the weapons into steel rebar. The company’s cooperation in recycling the metal allows the department to comply with its annual duty under the penal code. 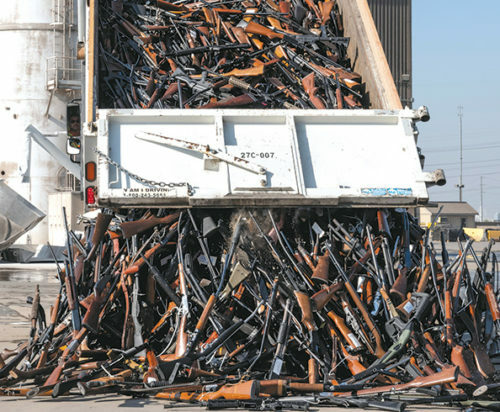 The Los Angeles County Sheriff’s Department and Gerdau will have destroyed approximately 170,000 firearms over the past 25 years.